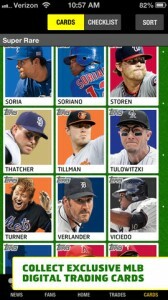 BUNT: The Exclusive MLB Digital Baseball Trading Card Game is an iPhone game developed by The Topps Company, Inc. This real-time, real world Major League Baseball digital trading card game is quite challenging, and great fun for sports fans of all ages. In BUNT, the cards you own can help you collect points based on how your players perform on the field each day. As with “traditional” cards, you can collect singles or multiple cards for over 300 of today’s hottest Major League Baseball stars. New players are being added every week. As a kid, I loved collecting Topps baseball cards. I wasn’t aware that Topps had finally made their foray into the digital world, but I’m really glad that they did. This app was clearly made with a lot of love by fans of baseball and baseball cards alike! In addition to the trading aspect of this app, there’s also a gaming/point scoring component. 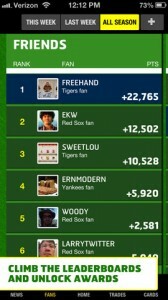 There are plenty of achievements to unlock as well, further incentivizing users to mess around with this MLB app. Cards in BUNT change in value based on actual on-the-field performance, all in real-time: how cool is that? This app will definitely appeal to older fans who remember physical baseball cards (and that deliciously awful bubble gum inside each pack!) 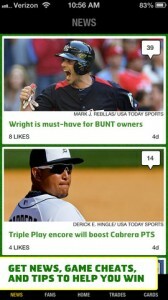 The BUNT game will also appeal to younger players who love digital card collecting and fighting games. Baseball has always been a game that appeals to statisticians: BUNT takes baseball’s obsession with stats to a whole new level thanks to real-time fluctuations in value. If you love baseball, you are going to love this game! Want to see BUNT in action? Check out the trailer on Vimeo! 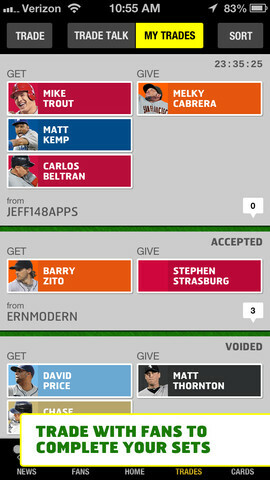 Follow @toppsbuntcast on Twitter, or check them out on Facebook! 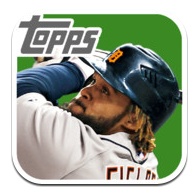 BUNT: The Exclusive MLB Digital Baseball Trading Card Gameis compatible with iPhone 3GS, iPhone 4, iPhone 4S, iPhone 5, iPod touch (3rd generation), iPod touch (4th generation), iPod touch (5th generation) and iPad. Requires iOS 5.1 or later. This app is optimized for iPhone 5.